In the mid-1990's, while working as a radio producer and host at WBAI 99.5 fm in New York City, I was introduced to Safiya Bukhari by fellow producer and community activist Sally O'Brien. Sally had been involved with and immersed in the anti-apartheid movement here in the states and had been an important player in the efforts to keep the issue of American political prisoners in the forefront of the American consciousness. Safiyah and I had many conversations about the injustices that poor people were subject to and the need to organize and resist oppression whenever possible. I was struck by her passion and the depth of her knowledge and commitment to the liberation struggle here and abroad. During my time at the radio station (1983-1999), I became involved with ADAM, the Afrikan Descendants Awareness Movement, headed by Brother Shine, an infectious cultural nationalist. Among the many activities of the organization was a feeding program that took place in front of the Apollo Theater on alternate Sunday afternoons. These feedings were funded by the organizations 'radical poetry' events that was held around the city at various locations. One such place was the UNIVERSITY OF THE STREETS located in the East Village. It was at an 'open mike' and poetry event that Safiya Bukhari stood in front of the microphone and began to recount the details of her life as an activist. She spoke about her political awakenings, her community work and her conversion to Islam. Safiya found in Islam the strength she needed to repel the dehumanizing conditions that is part of America's prison system. Safiya's Islam was rooted in the fight against oppression and a love for truth and justice. She analyzed the brutal oppression of her people by the state, the killings of un-armed men by the police and government policies aimed at squashing any attempt by the disadvantaged to assert their humanity. It was this knowledge that informed Safiyah Bukhari's Islam and her dedication to the struggle for an open and free society. LW: I began working on the book four or five years ago, when Wonda Jones, Safiya’s daughter, made a very important decision: In our grief at Safiya’s way-too-early death, we should not allow her work to be lost. It was a big project, as it turned out, because Safiya didn’t spend much time (none, in fact) planning for a book—she was too busy organizing. In my introduction toThe War Before, I describe the process of creating the book. A3N: What else can activists today learn from Safiya’s life? Safiya Bukhari was a dedicated community activist and former political prisoner. She joined the Black Panther Party in November of 1969. She and other activists formed the National Committee to Defend Political Prisoners. She later joined the Black Liberation Army (BLA). 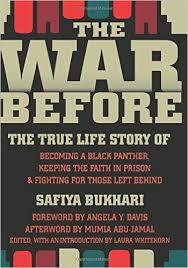 In 1974, Safiyah was subpoenaed to testify before a grand jury in a case against the BLA. Safiyah refused to testify and went underground. In January 1975, she was captured, convicted and sentenced to 40 years. On December 31, 1976 Safiyah escaped from the Virginia Correctional Center for Women. She was re-captured on February 21, 1977 and returned to prison. On August 22 1983, Safiyah made parole. Since her release, she has worked on the cases of political prisoners, including the New York 3 and Mumia Abu-Jamal. She was a founder of the Jericho Amnesty Movement. By 1998 she, along with others, founded the Jericho Movement to free all political prisoners. She was also a member of the Republic of New Afrika and, at one point, was its Vice-President. In the past decade, Safiya took on Islam as her religion and found great strength in the spirituality it embodied.